You are here: Home / Loves / HAD – Horse Addiction Disorder – It’s a real disease! HAD – Horse Addiction Disorder – It’s a real disease! HAD (Horse Addiction Disorder) refers to the psychological dependence on equines. Unfortunately there is no known cure for this condition as deprivation is likely to lead to the sufferers actively seeking and/or approaching random equines. Not only could this pose potential dangers to the individual, but this behavior inevitably reinforces the sufferer’s obsession with horses. It’s a vicious circle! HAD sufferers should be permitted their equine time despite the negative consequences which include: significantly reduced social hours with non horsey people, decreased regard for personal appearance, increased possibility of body odor, and the strong possibility of their obsession causing poverty. HAD sufferers are generally happy people, in fact all of them will tell you they don’t suffer from this condition, they survive because of it! It started for me about the time I turned 40, this overwhelming desire to be around horses as much as I could. It lead to the acquisition of two mares, which eventually led to the purchase of a truck and trailer, a large plot of land in the middle of nowhere and all kinds of various and assorted horse related accessories. Since this disorder (I can’t tell you how happy I am that I have a real disease and not just that I am weak and indulge myself) typically starts when women are in their early teens and have very little money, it usually isn’t quite as devastating financially. If it strikes when you are more established financially, that just means that you have more to spend (and lose) on treatment (i.e. more horses, more t-shirts with cute horse sayings on them, a bigger truck, bigger trailer, a barn, well, you get the picture). There was a time in my life when everything I did or said revolved around my disease. I worked all day, but then came home to brush, feed, clean and ride my horses. At one point, I ended up with nine of them! Fortunately, I’m in recovery. I still keep horses and love them, but I don’t feel like I have to buy every horse that looks like it wants to come home with me, and I don’t think every mare on my place needs to be pregnant most of the time. For one thing, I just don’t have the energy I had once and there are limits to what I can do physically and financially, so I’ve cut down, waaayyy down. Every once in a while though, I pass a new born foal on a neighbor’s farm, or I see an amazing stallion who would be a great cross on a certain mare and I get the itch. It’s probably something like an ex-smoker who gets a whiff of cigarette smoke on occasion. At any rate, I’m not ready to give it up entirely and who knows what the future will bring? There may be one more special baby who will take the show world by storm in my future. For now, I like to think of myself as being in semi-retirement. When the house is completely finished and I finally get a barn built, I may just start looking for that perfect Arabian mare who wants to have a baby or two. You never know what might happen around this place! That syndrome exists here in Chicago. It started in 5th grade with riding lessons. 20 years later, our daughter is a horse trainer (and makes a good living, happy to say). But they are all-encompassing, for sure. More photographs of your farm would be welcome. So you suffer from HAD also! I have moved the horses temporarily to a boarding facility until the house is finished, then I will build a barn. They took offense at the cold (they are Arabians). How fun for your daughter to make a living at something she loves!!! 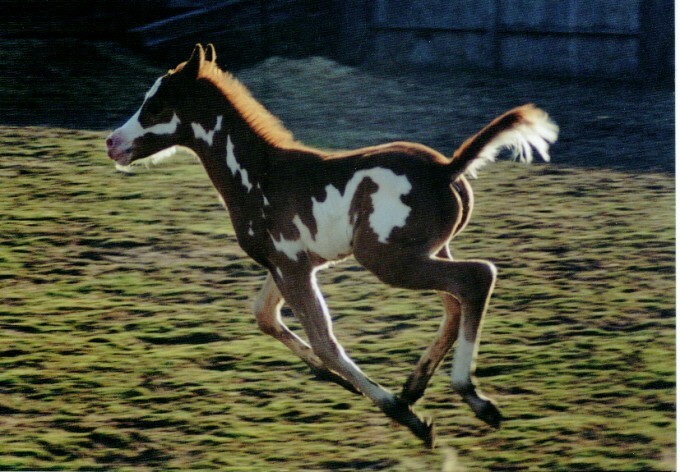 That foal is perfect! My Granddaughter (9) is in love with hoses. She went to “horse camp,” for a day last week and brought her notes to read to me last weekend. She takes jumping lessons once a week and longs for a horse of her own – not on the horizon at this point! I felt very similarly from the age of 8 or 9 on, and my life definitely revolved around horses for years until college came around. It’s one of the biggest things I miss living in the city. I love this! Of course my version is GAS (Goat Addiction Syndrome). 🙂 I do hope you have that last foal or so. Whenever I go crabbing, I see people riding horses on the beach. What a fabulous thing that is! Once, when my youngest brother and his family visited Tucson, we took them on a ride into the desert. It was such an excellent experience to ride toward the mountains at sunset! I’m sure they will never forget it. Had same addiction too – maybe will take it up again here with Andalusian horses! If I lived in a different part of the world, I would have the same addiction for sure. 🙂 Your post really made me smile — and the photo is precious! I look forward to the first two weeks in October at Myrtle Beach. Riders are allowed to ride on the beach. They are such magnificent creatures. Fancy free…. here I come world! Sounds like you are on a good track for handling your addiction! At least it’s a fun one!! That is a beautiful horse!! This was fun to read and know about you. I love horses, too, but my exposure has been limited to riding lessons when I was young and the occasional ride as an adult. I always dreamed of having horses, though. I just want a horsie! It’s a very healthy hobby that gives you many advantages mood. The dog, the horse, I am pretty sure these two animals were put here on Earth to give solace to human beings. Whether it is a disease, an addiction or an incredibly fortunate circumstance, being able to own horses is a gift. What a beautiful post for letter H.
I get it, though I’m not a fellow sufferer! I think that this addiction has a lot of benefits! We gave a horse to our 9 year old granddaughter — and four years later, she has two more. Good thing her mother shares the addiction. It’s wonderful to see her with her horses. I hope her disease never goes into remission. I know a few horse “addicts.” My experience is that often people good with animals, are not as good with people – but that’s okay! sounds like a wonderful disease! Horse lovers abound in my area. I did like riding them when I was younger (or even older for that matter). It’s been awhile…. I have a few family members with this particular disease! I was cured a long time ago when horse walked up and bit me on the shoulder. Hard. Everyone said I must have done something but I was just standing there beside the fence and it happened. I believe I have HAD. I own 4 horses one is my barrel horse and one is a trail horse! I have a yearling that I will be training to rope and the other is a jumper! I can not go a few days without riding my horses. And the smell is like a drug to me! When I get deprived of horses during winter and it’s to cold to ride I go and sit in my horse barn and drink in the smell. I love my parents dearly for purchasing my first horse and encouraging me to get into riding!